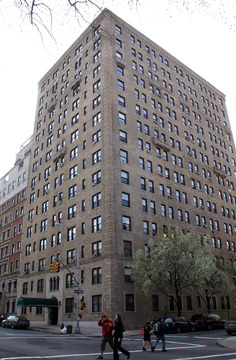 This attractive beige-brick apartment building at 467 Central Park West was designed by Gronenberg & Leachtag in 1928 and converted to a condominium in 1993 by the Ziegelman organization that then called it The Warner. The 17-story building, which is on the southwest corner at 107th Street, has 99 apartments. It has a doorman, sidewalk landscaping, some decorative balconies and terracotta decoration, a courtyard, a bicycle room, storage space and a small cornice. The building has a two-story base with large quoins and above it are more delicate quoins. The building has a two-story entrance surround. The building, which is also known as 2 West 107th Street, is pet-friendly and overlooks Central Park. It has three arched windows with Ionic columns above its canopied entrance. There are subway stations at 110th Street on Central Park West and Broadway. Other buildings designed by Groenberg & Leachtag include the hotel property on the west side of Seventh Avenue between 55th and 56th Streets, 1230 and 1235 Park Avenue, 639 West End Avenue, 50 Riverside Drive, 124 West 79th Street and 130 and 315 West 86th Street.